Japan has long been a destination for any traveler dreaming of an excursion in Asia, where teeming mega-cities are offset by ancient temples, and provincial spa towns meet neatly cultivated farm regions and rugged wilderness. Japan is a land of constant contradictions. Archaic castle towns are in sharp contrast with ultra-modern technology and sky-scraping steel jungles shelter delightful gardens. 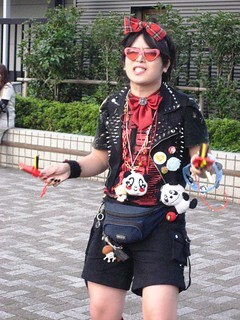 And let’s not forget Japan’s uber cool Harajuku kids who are juxtaposed alongside Rockabilly greasers and kimono-clad geisha. Given that there is so much to see and do, and there are so many contrasting experiences that can be enjoyed, John and I wanted to experience both city life and the rural countryside in the limited amount of time that we had in Japan. While the thought of whisking through the countryside on Japan’s Shinkansen may be the quintessential travel experience, two tickets do not come cheap and we did not want the hassle of trying to navigate bus and train routes outside major urban areas. Furthermore, with just two weeks to see and do as much as possible, we wanted to capitalize on every moment. After a lot of consideration and research, we found a Japanese car rental agency offering rates significantly lower than the cost of two Japan Rail Passes. The freedom of having our own wheels and setting our own schedule was too great to resist. Overall, we found Japan very easy to navigate by car. Thus, our plan for a great Honshu road trip was born. Budget travel in Japan is definitely do-able, and we stayed on our travel budget by following a few simple rules. We walked as much as we could and we occasionally purchased city day passes for buses and subway systems to save on gas. In the evenings, we stayed in a variety of inexpensive budget accommodations, ranging from youth hostels and business hotels to minshukus – small family-run inns that provide a meal and a traditional bath. We dined on fresh fruit, bento boxes and fresh Nigirizushi and Makizushi rolls from local supermarkets and convenience stores during the day, and allowed ourselves some nice meals out. Although Japan is expensive and you’re charged for pretty much everything, we found that we were still able to stay within our travel budget. Our journey began in Tokyo. We stayed with friends, so there was no need for a hotel or a car. Instead, we strapped on our walking shoes and started walking. Tokyo delivers top-notch entertainment for next to nothing. Head to Yoyogi Park on Sunday for some people-watching and enjoy art displays and martial arts demonstrations, outdoor raves, live music, drumming circles, and dance routines. Snapping photos of Cosplay kids in Harajuku, window-shopping, a visit to the world’s busiest intersection in Shibuya, or a stroll along the promenade in Odaiba Bay are all wonderful opportunities for learning about daily culture and life in the big city. 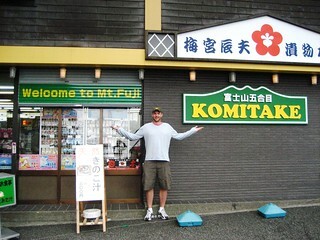 After Tokyo, we honed in on Japan’s most recognizable landmark, Mt. Fuji. The drive to Mt. Fuji and our subsequent hike was no less than stunning, even though the mountain was swathed in heavy cloaks of thick mist for the duration of our time there. We ran into a group of Japanese high school students whose welcoming smiles and requests for photos instantly made us feel like celebrities. Our new friends fortified us for the next leg of our journey with a few boxes of cookies, and we left feeling that our time on Fuiji-Shan had been well spent. Then we made a beeline for the healing hot springs of Hakone for a night of steamy blissful rest and relaxation. We skipped the pricey cable cars and ferry rides and opted for a beautiful drive around crystal clear lakes to admire the new fall foliage. After Tokyo, our visit to Hakone was like stepping away from reality. Hakone’s calm mountain oasis offered us rest and relaxation after the hectic pace of city life. The long leisurely drive from Hakone to colorful Osaka was a scenic delight, and when we reached the heart of the city, we headed up, way up. From the great height of one of the world’s largest Ferris wheels, we witnessed city lights blazing and twinkling like a string of precious jewels. Later, we meandered along the wide, crowded avenues of a shopping arcade, where we dined on all-you-can-eat shabu-shabu along with flashing neon lights and pumping Japanese disco beats. The part I enjoyed most about Osaka was our visit to an outdoor museum that features different types of traditional Japanese farmhouses from all over Japan. We found a very friendly volunteer guide sitting just outside the park. After inquiring after his services, we thought that having our very own personal tour guide in exchange for a free meal was a great deal. We spent two hours with Yuto and then wandered the park for the rest of the afternoon on our own. It was one of my favorite afternoons of the whole trip. Volunteer guides, by the way, are a great way to learn about Japanese culture. Most of them are elderly volunteers who are happy to spend time with you for a free meal and the chance to practice their English. Japan’s ancient cultural heartland, Kyoto, delivered splendid castles and gardens, burnished pavilions, and a glimpse into the past on the old streets of Gion. We admired the streets and architecture bathed in the light of softly glowing lanterns. Eventually, we stopped for a rest in a crowded outdoor park to watch a traditional play unfold at sunset. The music and traditional costumes set in a shady park flanked by narrow, lamp-lit streets created an atmosphere from out of time. It was an incredible, magical evening. Later, we traveled to the village of Kurama, just a short distance outside of Kyoto. Best known for its onsen and rural country lifestyle, Kurama is a beautiful place for hiking and enjoying nature at its best. That afternoon, we drove to a famous garden temple west of Kyoto, where we witnessed the transient beauty of these gardens, surrounded by rushing waterfalls, moss-covered stones, hills, lakes, and forests. The road to Nara offers endless rice paddies, and depending on the season, you might see tall, long tender shoots of green grass waving gently in the wind or freshly cut bouquets of long golden sheaves lying along the side of the road like offerings for passing motorists. It was harvest season when we arrived on the outskirts of town. We parked the car on a windswept patch of grass, hopped a fence and started walking; the vivid blue skies and fluffy white clouds created an amazing backdrop for the old houses and lush rice fields. Eventually, we came to an abandoned fishpond, its murky depths obscured by fallen leaves on the surface of the water. We wandered around it and followed an old set of train tracks, which lead past a giant temple out in the middle of nowhere. 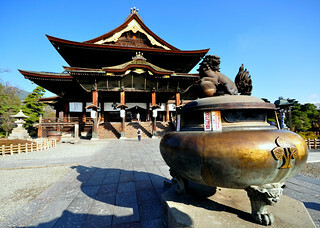 Nara’s unique ambience provided gorgeous temples and pagodas, a bustling market area, and a chance to mingle with both two- and four-footed residents of Nara Park, where we received a warm welcome from the latter in exchange for some deer cookies. Our new friends were so eager to see us, they practically knocked us over in their haste to say hello. Nara’s infamous Sika deer are allowed to freely roam around Nara Park, although it’s fairly common to see them walking in the streets and taking a nap on the sidewalks. 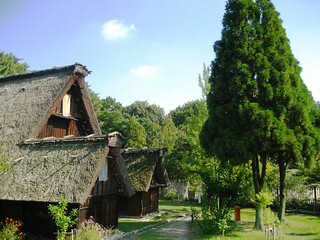 Local folklore suggests that the deer are considered sacred because of their association with the gods of Kasuga Shrine. It’s said that one of the gods appeared riding a white deer. From then on, the deer were considered divine. Today, they are designated as National Treasures. 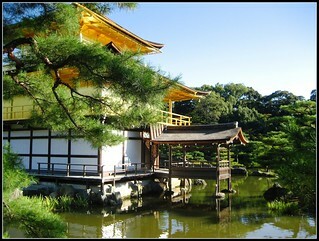 The park is also home to Todai-ji, the largest wooden building in the world. Nara was certainly a magical place to visit and I highly recommend adding it to your travel itinerary if you have the time. It is considered to a place of scenic beauty in Japan, and was designated so by the Ministry of Education, Culture, Sports, Science and Technology. From Nara, we drove high into the massive Japanese Alps, passing through a wealth of picturesque villages and traditional onsen towns which are famous for their healing mineral hot-spring baths. With peaks higher than 3,000 meters, the Japanese Alps offer a range of outdoor activities, such as trekking, mountain climbing, and skiing. They’re also terrifying to navigate at night. The road snakes and turns; we were constantly going up and down, but the journey was worth it no matter how nauseous I felt upon arrival. Nestled among towering snow-capped peaks and winding mountain roads, we came upon the bustling temple town of Nagano. As home to one of Japan’s most popular temples, Zenkoji, Nagano has a fair share of monthly festivals, including an unusual harvest festival in mid-October which involves a number of young townsmen dressed in loincloths, carrying a special, decorated palanquin containing the local Shinto gods on their shoulders.The young men are accompanied by townsfolk wearing traditional clothing, marching drummers and musicians playing traditional instruments such as the three-string bango and the zither. Festivals in Japan are a colorful and joyous affair, and its easy to get caught up in the swirling crowds of townsfolk. Everywhere we went we were greeted with welcoming smiles and offers to shake hands. We arrived in time for Nagano’s harvest festival, where we watched the activities mentioned above with gusto. It was the perfect way to end our trip before heading back to Tokyo. Best of all, our arrival was perfectly timed as we had no idea the festival was on until we checked in to our hotel. In Japan, the scope of experience waiting for you is truly immense. There is something here for every age and taste, whether you are interested in climbing steaming volcanoes, seeking serenity in landscaped gardens, enjoying traditional architecture, relaxing in a provincial spa town, venturing through the rugged Japanese alps, or chasing modern pop-culture in neon-lit urban jungles. Today’s Japan is a country for all types of travelers, including those on a budget. If you’re a traveler who likes to experience both city life and the stunning rural countryside, consider a road trip through Honshu, Japan, where a magical world awaits you at each step of your journey. Thanks, Robert. I really appreciate your support! you write incredibly well. are any of your articles published? / have they ever been? Thank you! I’ve written for a few small publications and I worked in a publishing company producing ESL related content for a few years. Nothing special, so I do appreciate your comment! When I was there I caught several of these places, but missed out on many. Kyoto – the city itself was disappointingly more boring than Tokyo. A lot less diverse, grey… box buildings everywhere and straight web-like streets. Osaka and downtown Tokyo were the of course, the most diverse and most colorful.